a corn of wheat [pepper] ひと粒の小麦[こしょう]. eat corn on the cob 軸つきトウモロコシを食べる. a field of corn 穀物畑. That book is pure corn. あの本は実に陳腐だ. From Middle English corn, from 古期英語 corn, from Proto-Germanic *kurną, from Proto-Indo-European *ǵr̥h₂nóm (“grain; worn-down”), from *ǵerh₂- (“grow old, mature”). Cognate with Dutch koren, Low German Koorn, German Korn, Norwegian and Swedish korn; see also Russian зерно́ (zernó), Czech zrno, Latin grānum, Lithuanian žirnis and English grain. (Britain, uncountable) The main cereal plant grown for its grain in a given region, such as oats in parts of Scotland and Ireland, and wheat or barley in England and Wales. Among the divinities that dwelt on Mount Olympus, none was more friendly to the husbandman than Demeter, goddess of corn. However much the individual manufacturer might give the rein to his old lust for gain, the spokesmen and political leaders of the manufacturing class ordered a change of front and of speech towards the workpeople. They had entered upon the contest for the repeal of the Corn Laws, and needed the workers to help them to victory. They promised therefore, not only a double-sized loaf of bread, but the enactment of the Ten Hours' Bill in the Free-trade millennium. [T]here exists arguments in favour of regarding one of the eatable varieties of "leaven," Machmetzeth, as the beer of the Hebrews. The mention of beer by the Egyptians is frequent; under the name of Hek, two intoxicating beverages are included. The components of these beers, individually, are not known: one was made from corn, the other was a medicated or sweetened beer, due to the addition of honey, or system of brewing. I found that we had nearly a hundred bushels of corn, including wheat, maize, and barley, to add to our store. (US, Canada, Australia, uncountable) Maize, a grain crop of the species Zea mays. The planting or sowing of maize, exclusively called corn, was just accomplished on the Town Hill, when I reached it. A grain or seed, especially of a cereal crop. He paid her the nominal fee of two corns of barley. From Middle English corne, from Old French corn (modern French cor), from Latin cornu. 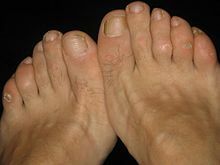 A type of callus, usually on the feet or hands. Welcome, gentlemen! Ladies that have their toes / Unplagued with corns, will have a bout with you. This use was first used in 1932, as corny, something appealing to country folk. (US, Canada) Something (e.g. acting, humour, music, または writing) which is deemed old-fashioned or intended to induce emotion. He had a sharp wit, true enough, but also a good, healthy mountaineer's love of pure corn, the slapstick stuff, the in-jokes that get funnier with every repetition and never amuse anybody who wasn't there. There were lots of jokes on the show and they were pure corn, but the audience didn't mind. The bulk of this humor was pure corn, but as hillbilly material it was meant to be that way. From the resemblance to white corn kernels. (uncountable) A type of granular snow formed by repeated melting and re-freezing, often in mountain spring conditions. From Proto-Germanic *kurną, from Proto-Indo-European *ǵr̥h₂nóm (“grain”). Cognate with Old Frisian korn, Old Saxon korn (Low German Koorn), Dutch koren, Old High German korn, Old Norse korn, Gothic 𐌺𐌰𐌿𐍂𐌽 (kaurn). Hīe wǣron benumene æġðer ġe ðæs ċēapes ġe ðæs cornes. They were deprived both of cattle and of corn.